Your endless wiring nightmares as configuring new extensions in the legacy PBX system are going to end. Just plugging/unplugging for the configuration! This is what VigorIPPBX 2820 embedded browser-based admin-function can do for multiple IP-based phones located under different LAN. The simplicity is opposed to costly services charged by legacy PBX vendors. 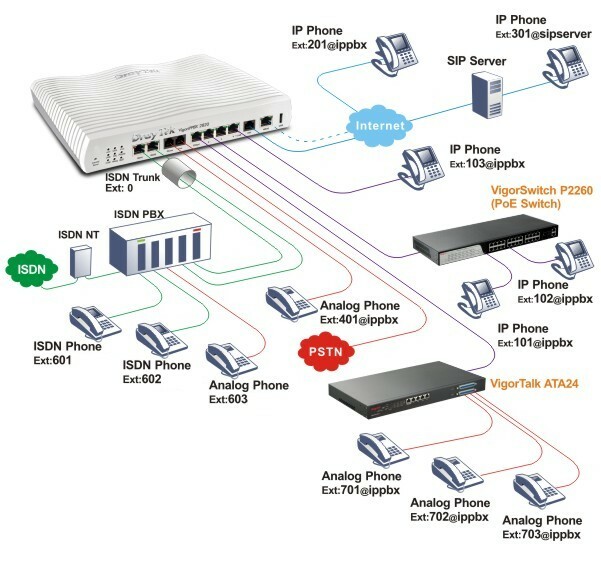 The unified data applications and voice network of VigorIPPBX 2820 lets demands on the voice packet prioritization of the LAN infrastructure to assure quality of voice. Hence, the IP-only system results in economies such as the reduced cost of adds, changes and moves the labor of wiring a single converged network. Your monthly basic VoIP fee charged by ITSP could sound reasonable; however, you may complain about those al carte expense caused by call transfer, call waiting music and so on. 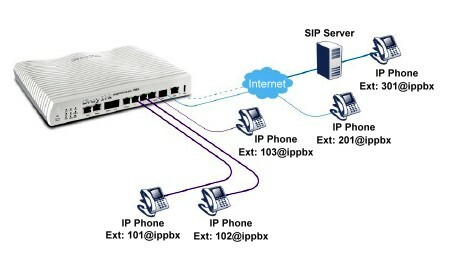 VigorIPPBX 2820 delivers a new architecture for flexible- extension-logic communications by using the Session Initiation Protocol (SIP) to establish voice connections between users and combines the rich-features of the PBX with networking advantages combined with trunking and scalability. 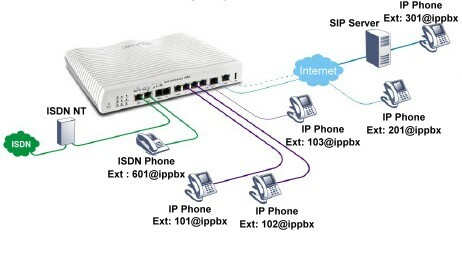 In addition to save your monthly fees, the IP PBX function can provide up to 50 extensions setup to let all registered IP phones in the LAN or remote sites around the world have unlimited free calls through Internet. Moreover, VigorIPPBX 2820 is able to establish multiple networking architectures corresponding to your current desire and future needs of growing communication. 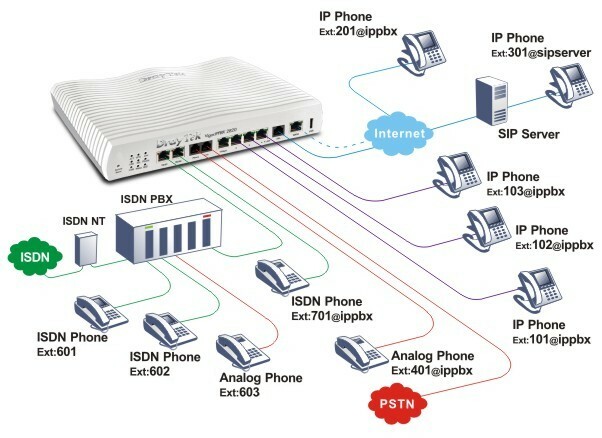 Its ISDN/PSTN compatibility lets you move from simple VoIP solution such as IP phone and Softphone to integrate with comprehensive networking infrastructure, such as ISDN and Analog phone line any time you need. Not enough for your desirable cost-effective communication? Don’t worry; VigorIPPBX 2820 has more to offer. Its Digit Map function allows you to set up rules for particular call destinations through the most cost-effective way to reach them. For instance, you can route local calls via your PSTN/ISDN line (if you have a free calls package) whereas international calls can go via your preferred VoIP provider. Digit Map¡¦s flexibility can align with your local service package to give you the most economical calls all the time. Let’s think what’s the fundamental thing about making a call? You would say “Just don’t miss it”, right? VigorIPPBX 2820 router has voice mail to e-mail functionality that allows you to make immediate responses to those important messages even though you are 1,000 miles away from the office. 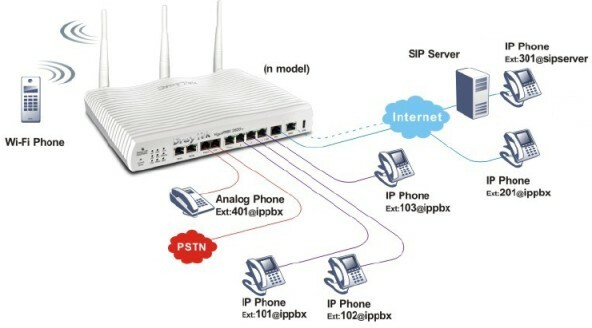 You are satisfied with VigorIPPBX 2820’s Telephony functionalities. But your next question would be “How about Security”. VigorIPPBX 2820 provides up to 32 VPN tunnels and object-based firewall to secure your networking communication. 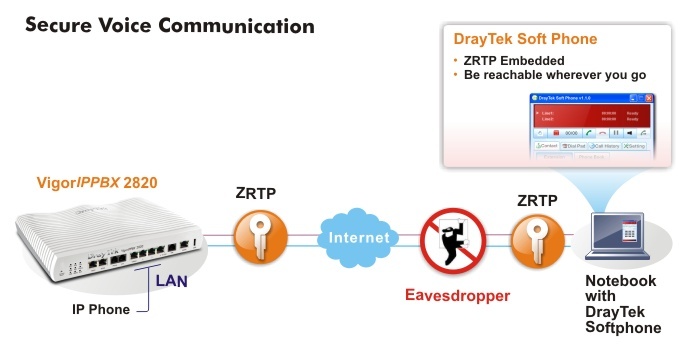 By adopting hardware-based VPN platform and hardware encryption of AES/DES/3DS, VigorIPPBX 2820 router increases the performance of VPN greatly, and offers several protocols (such as IPSec/PPTP/L2TP) with up to 32 VPN tunnels. VigorIPPBX 2820′ flexible object-based firewall secures your network via DoS/DDoS prevention and URL/Web content filter to strengthen the security outside and control inside. In addition, VigorIPPBX 2820¡¦s object-based design used in SPI (Stateful Packet Inspection) firewall provides the painlessly easy firewall policy setup process for users. Your business continuous and disaster recovery are also taken care by VigorIPPBX 2820. 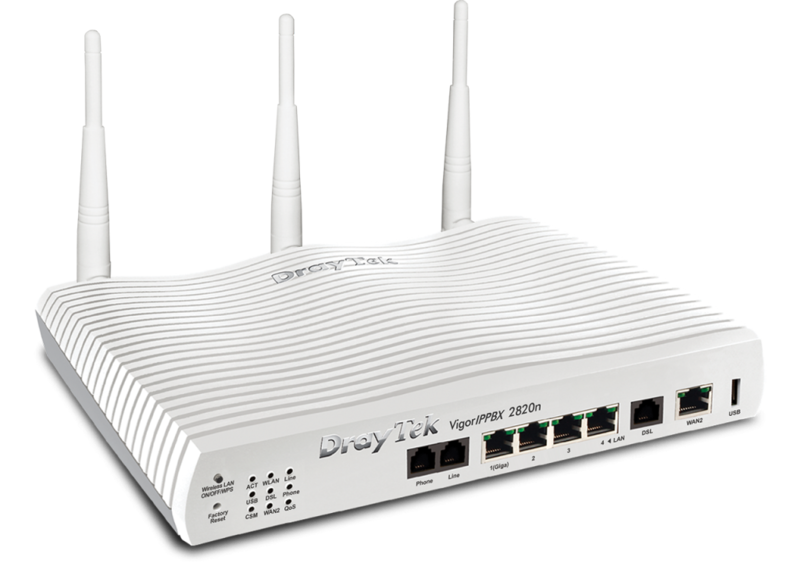 In addition to the primary ADSL interface, the VigorIPPBX 2820 has additional WAN port connecting to a second xDSL modem or any other Ethernet-based Internet feed for your backup Internet access and load balancing. Furthermore, all traffic will be switched back when normal service is resumed to your primary line. So, you won’t worry about ITSP’s system downtime. The second WAN port also further ensures your voice quality through its stable connectivity. On the other hand, VigorIPPBX 2820’s USB 3.5G capability lets you get Internet access before your local ISP service available and have another connection backup. (Note: Choose either USB 3.5G connection or Ethernet connection for WAN 2). You can leave VigorIPPBX 2820 as media-sharing server while you are away home or office! Then the hard-drive or flash-based USB storage device will act as FTP server and the users can access it by any FTP client from LAN or WAN. If you are an editor or journalist, you can let newspapers or magazine download your reports as well as high-resolution photos while you are chasing latest news. If you are film-lover, USB hard-drive can be attached to VigorIPPBX 2820 router to download file without turning on your PC. VigorIPPBX 2820 lets you easily back up files or access saved media files! SoHos, you don’t need to have a deep packet for the comprehensive IP Telephony solution. 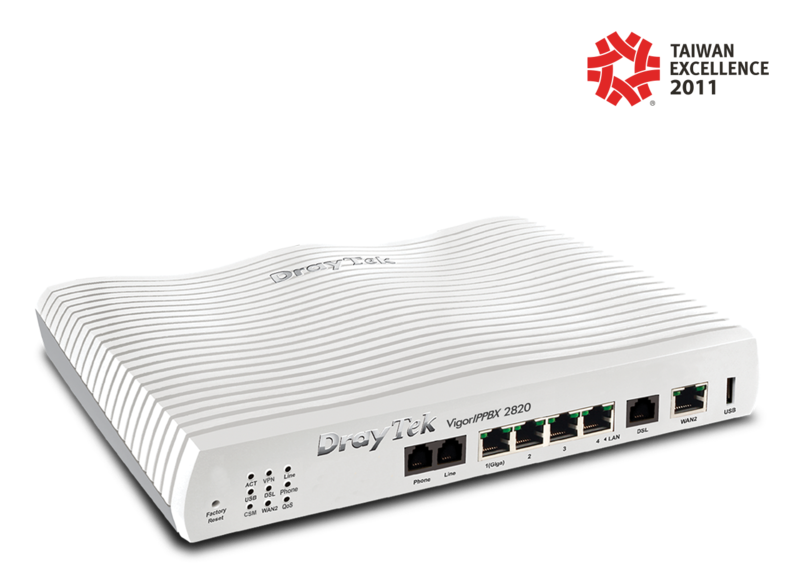 DrayTek’s VigorIPPBX2820’s enterprise-level VoIP voice streams over multi-locations connectivity as well as reduce infrastructure complexity and strengthen productivity. The Virtual FAX feature can verify different Caller IDs from SIP/PSTN Trunks and then forward to the pre-defined extension via FAX-to-E-mail. Therefore, there won’t be any paper expense. You don’t even have the call cost if the FAX file is sent by the SIP Trunk.